School Zones… making motorists everywhere accountable for your children! Is it just me, or do ‘School Zones’ seem a bit, I dunno, dumb? They certainly know how to labour the point. I get what School Zones were intended to achieve when they were first introduced to this country. What I don’t get is why it was decided to treat a sympton of the problem, rather than the problem itself. I’m also not entirely clear about why that guy jogging along the footpath is moving faster than I am when, for most of the 90-odd minutes that School Zones are enforced, my ‘run over some dumb kid’ window of opportunity is only really open for about 15 minutes? Particularly in a city like Sydney, with roads that are already congested to breaking point, surely there’s a more efficient way to do this than to create even more congestion by slowing everyone down to a snail’s pace whenever they’re within coo-ee of a school? And let’s not forget that all School Zones are also liberally peppered with speed cameras – if we don’t drive off the road and run into a child from all the confusion of not knowing where one School Zone ends and the next one begins, we’ll be done for speeding… they’ll get us one way or another! Yes, The Honourable Duncan Gay, Minister for Roads and Ports in NSW, I’m talking to you! Have you ever driven along the Pacific Hwy through the North Shore at 3:45 on a weekday afternoon? Or along Pennant Hills Road from the end of the F3 towards the city at the same time of day? Have you ever noticed the number of schools along both of those absurdly clogged-up stretches of tarmac? They’re everywhere! And whenever I’ve had the misfortune of passing them during School Zone periods, I’ve invariably never seen even one solitary child. And just one child is all I’d need to see, as I pass through yet another School Zone utterly devoid of children, to feel at least a bit better about that old bloke in his front yard pushing his Victa over the lawn faster than I’m legally allowed to drive! Why should I have my travel time increased just because parents and schools aren’t held accountable for the wellbeing of their own children and students? Coz let’s be honest about this, that’s what we’re talking about; that’s the real problem here – not that I drive recklessly around school zones; not even that some kids are dumb enough to think they can run into the middle of the road without looking and expect not to come into violent contact with a car (though, it’s true, that is pretty dumb). The bottom line is that I – along with every other hapless driver who happens to pass the school that your child attends – am held accountable for the behaviour of your child. And where are you while I’m shouldering this extraordinary burden on your behalf? At home enjoying a cuppa and the last half hour of Sunrise, maybe? Or perhaps you’re still sitting in your never-goes-offroad 4WD SUV and parked around the corner from the front gate of the school? Or maybe you’re already at work because you can’t afford the mortgage, the two SUVs, every electronic device on the market, the kids’ sports, your always up-to-the-minute wardrobe and that busy social life of yours without both of you working? Boo-hoo, cry me a river – if you couldn’t afford kids in the first place, you shouldn’t have had them! Wherever you are, you’re not here. I, however, am here and I choose not to have children because I don’t want any, yet I’m still somehow responsible for how yours behave outside their own school. Reconciling this equation is a constant struggle. So if parents refuse to hold themselves accountable for their own children, what about the schools? Lollipop Ladies (and Gents) are still used at some schools – why not promote them to permanent School Zone traffic wardens? Have them pacing up and down the road outside the school preventing stupid children from running into the road. Or why not install teachers from the school itself to patrol the area for the duration of the morning and afternoon School Zones? We always had teachers loitering disinterestedly at the school bus stop of an afternoon until the last child was whisked away by the last bus – surely this is much the same thing? But of course, schools everywhere would claim that this would be entirely impractical because there simply aren’t enough children to supervise for the full 90 minute duration of the School Zone speed limit reduction – tell me something I didn’t already know! Why, then, is it acceptable to bring an entire city to its knees by having every single motorist passing every single school slowed to 40km/h for the full 90 minute duration of each School Zone period, despite there invariably being not a single child in sight for the first and last half hour? It’s truly laughable. OK, here’s a thought: why can’t ‘stupid people’ fencing be erected along the length of roadway outside and around all schools? I’ve seen it work to marvellous effect in other cities – and not just where schools and children are concerned. Central London, for example, is littered with ‘stupid people’ fencing that prevents stupid people from wandering thoughtlessly into the road and it’s presumably saved countless stupid people from being run over by big red buses, black cabs, horse-drawn Royal carriages, delivery vans, Vespas, bicycles and any number of other vehicles. Why not adopt a similar scheme here in Australia? Not only would it work wonders in the Sydney CBD, where stupid people step thoughtlessly off the footpath with tedious frequency, but it would also be the perfect solution for School Zones. No more 40km/h speed limit reductions; no more speed cameras popping up like giant inanimate meerkats and distracting drivers from the actual job of driving; and no more opportunity for stupid children to wander into the middle of the road and damage my car! Oh but the cost – it would be prohibitive, I’m sure. Far easier to just keep slowing everyone down and make our already over-populated road system just that little bit less enjoyable to use. In the end, that guy’s still jogging along the footpath faster than I’m driving along the road. I bet he’s never been told to slow down. Which is weird coz at the speed he’s going, I’d hate to think what would happen if a child ran out in front of him! Meanwhile I hear there was a nasty incident involving a stupid kid running out in front of a snail recently. The snail was fined for speeding through a School Zone. Oh Mashii, where do I begin…..mmm….the guy jogging will never damage a child the way your car will. Schools finish at different times which includes the time in which kids get off buses and are walking home as well. My kids are well behaved and watch for cars but that doesnt mean they wont be distracted and walk across the road at the wrong time. It would only take one time for a car doing over 40 k to take my kids from me. Yes,some kids make mistakes and think they can beat the traffic but most kids arent stupid. Kids make mistakes, just like we do. Hmmmm… maybe we need 40km/h speed limits everywhere, all the time? I was right. I agree wholeheartedly. I am constantly tailgated as I do the school zone speed limit, often by parents with their children in the car. There’s several stretches of road where there are purpose built pedestrian overpasses for schools and there’s STILL a school zone (Loreto Normanhurst, Abbotsleigh Wahroonga and even here in Campbelltown)! Around the corner from me, there is a beautifully equipped state school for children with profound physical disabilities. They’re collected from home by bus and taken into the school to be assisted out and inside. WHY does that school need a school zone?! I love it that I live in country with stupid people fencing. 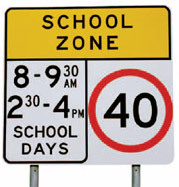 However, they also have reduced speed for school zones (30mph, sometimes 20) so not entirely eradicating the problem.